Four people escaped from a car which suddenly went on fire on the Creggan Road on Wednesday morning. The incident brought traffic to a stand still in the area and the Northern Ireland Fire and Rescue Service (NIFRS) attended the scene. 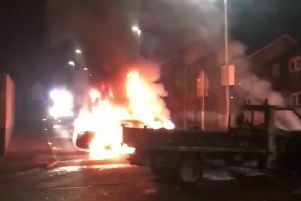 “NIFRS received a call at 8:19am to a report of a car on fire at the Creggan Road area of the city on Wednesday morning,” said a NIFRS spokesperson. “One fire appliance from Northland Fire Station was deployed to the scene. The driver and three passengers were out of the vehicle upon arrival of fire fighters who dealt with the fire. “The incident finished at 8:40am and is being treated as an accidental fire,” the spokesperson added.